Just the usual, no new ones. Too bad, but thanks for the info. To be fair, Miura has forgotten small details on Guts like this before. You're right, but we're talking about a volume cover here. I doubt his assistants and editor wouldn't point it out to him. My guess is he thought it looked good like this and just didn't bother to change it. My guess is he thought it looked good like this and just didn't bother to change it. I know that in recent times Miura hasn't done any significant changes to episodes in the volume release but i was hoping he might touch up episode 347. That episode looks worse than any other episode from the last few years, very unpolished. Well I thoroughly disagree with that, but no there are no changes to this episode. Without a fairy, you're not even a real man. I agree, the facial expressions in that episode are hideous. I don't think it looks hideous at all, don't get me wrong. the episode looks good but some of the faces looked off in some panels and when you compare it to the following episodes, it simply doesn't match up in my opinion. 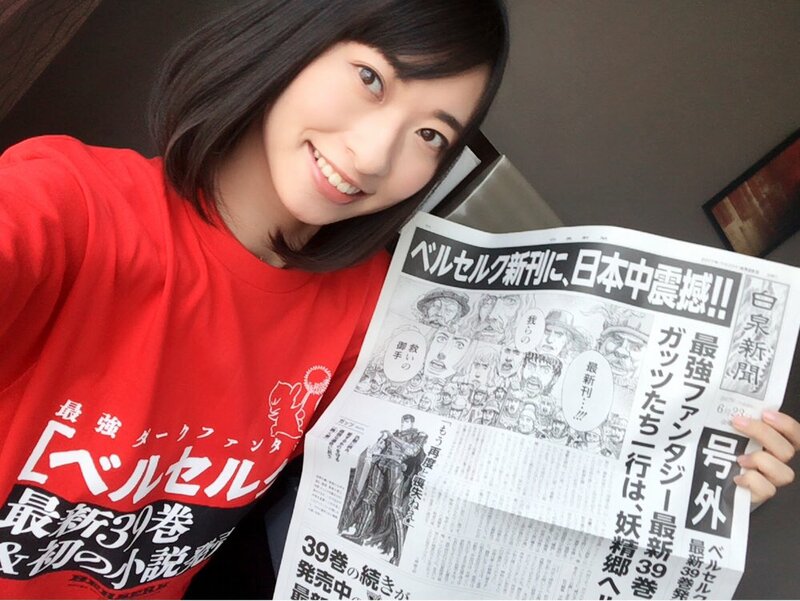 Yuka Kuramochi has been distributing what I guess are prints of the extras/promo images along with the release of Vol.39 and the new Novel. Can anyone confirm if these have been seen before? I like Guts's "collage"
Yes, this was a promotional operation to advertise those releases. It also includes a full page version of volume 39's cover illustration. The collage itself is new, the rest isn't. It also includes a full page version of volume 39's cover illustration. Neat, thanks for the info. If anyone is curious, the newest episode is not in the volume. So less than 200 pages. That hurts more than the Anime. even the horses are cut in half! I wouldn't say more but close. That thing was pretty awefull vs only 8 episodes. We already knew the page count: it's 196 pages. As for actual manga content, it's 172 pages total. That's disappointing, I was hoping that a lot of the wonkiness from 344-347 would be fixed. Apart from some trees and bushes that look kinda weird in 344, I can't think of many things that should have been fixed. There's a noticeable change in style, and some traced closeups and group shots, but I think the episodes look good. My volume came the other day and I really don't see any "wonkiness". I really think people are making a big deal over nothing. All the art work in the issues of Young Animal has always looked fine to me. It is these weird scans that people are seeing that are different. Going on and on about line thickness and traced panels is asinine. The volume looks great and the digital painting of all the elves looks fantastic. He really has mastered a new skill. Maybe this is part of the reason why releases have slowed down, he wanted to learn how to draw/paint another way. The style Miura draws some things may have changed over the last few years, but that is nothing new. Also they may be using different tools to create some of the backgrounds and tones, but this is nothing drastic. If you want to criticize his work, I think you can comment on the already mentioned cover art. If you really want to get nit picky there are a few panels where there are some blank faces on characters, and the only reason they stand out is because he usually takes the time to add those tiny details in. If you really want to get nit picky there are a few panels where there are some blank faces on characters, and the only reason they stand out is because he usually takes the time to add those tiny details in. Just so it's clear, most of the background faces or art that doesn't have much added value is drawn by assistants and not Miura himself. And the difference between his work and that of his assistants is typically quite easy to spot. Although the line work looks much better in the volume, it is clearly obvious that Miura has been using much thicker lines for his characters. This could well just come from him drawing on his tablet, but all in all compared to the way he used to draw faces, i don't think it looks great in some of the episodes that we have in this volume. The best example i have would be this panel from episode 347. Unfortunately we don't know the extent of Miuras digital work. If he has fully transitioned by now, i would love to see him experimenting more with the lines that tablets offer. There are also a few instances in the volume where panels get reused. On the left, there are obviously differences but there are also striking similarities, hatch lines are placed in the exact same places throughout, the nose, the bangs on the hair etc.... On the right, the whole thing is copied then slightly adjusted because of the lighting of the scene. Again, this isn't a big deal at all and I'm sure you all noticed as well but they stuck out like a sore thumb. My only complaint about the current berserk art style (and this is just minor) is the way guts' face looks, this is just personal preference but i prefer how he looked in previous volumes. 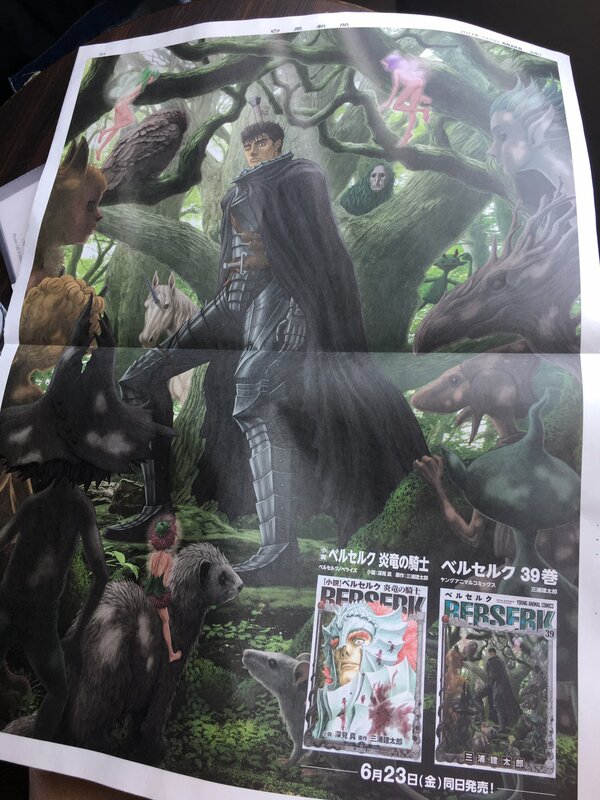 Berserk's art style never stays and it will continue to evolve in the coming years. I hope i didn't come off as if i was making a big deal about any of this because that wasn't the intention. Some quick observations, having received my volume. First, Miura has a new assistant called Minoru Hirata. Second I really like the poster of the Sovereign of the Flower Storm, I think it's one of the best illustrations in recent memory. Lastly, I love the little picture inside even more (it's about this volume's real stars: the mushrooms). Even when dealing with Guts and the rest of the main cast? It's only a couple of instances, but it just stuck out because for majority of the time, there is detail when it can fit. Although the line work looks much better in the volume, it is clearly obvious that Miura has been using much thicker lines for his characters. To me this is a bit silly. The thickness of the lines on a characters face varies from panel to panel, just like they always have. I grabbed a few volumes off the shelf to find a comparison, opened volume 33, and right there on the first page is a similar profile of Guts. The lines of his neck, jaw, nose, ear, and parts of his cheek are pretty much the same compared to the panel from volume 38. Again, this isn't a big deal at all and I'm sure you all noticed as well but they stuck out like a sore thumb. I did not notice this while reading episodically, and I can't say I would have if I was even reading it in the volume. A director I work with often uses a phrase that I believe applies here. "If they are paying attention to that, I lost them." It is interesting to see him recompose art to use again. I wonder if this will be a common thing. It completely depends on the scene/panel, but yeah even the main cast can be drawn by an assistant. Of course the beauty of it is it's not too obvious so long as you're not expressly looking for it. This is related in that I think reusing panels is something that's being tried by the team to lighten their work load. 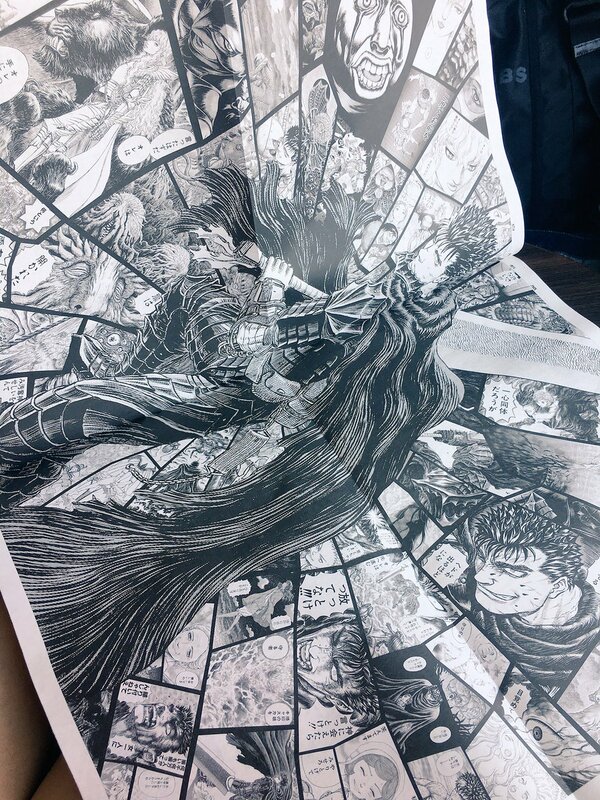 Seems they're trying to remix Miura's own artwork to produce a quality result with less effort. Obviously it's had varying degrees of success, so I'm not sure how it'll go in the future. Going on and on about line thickness and traced panels is asinine. I guess some people are a little more interested in the details of his technique's evolution and the choices he makes as his style changes. I spend quite some time looking at Miura's artwork, and discouraging this kind of discussion altogether just because some people make crude comments that may sound disparaging is a bit rude. Yeah, overall I'm perfectly okay with where they're repurposing drawings so far. And I think it's very likely that this is gonna be harder to spot from now on. Second I really like the poster of the Sovereign of the Flower Storm, I think it's one of the best illustrations in recent memory. It really is pretty incredible. He's made quite a bit of progress in the year since the we first saw his digital colored work. The hands of the sovereign look lifelike.